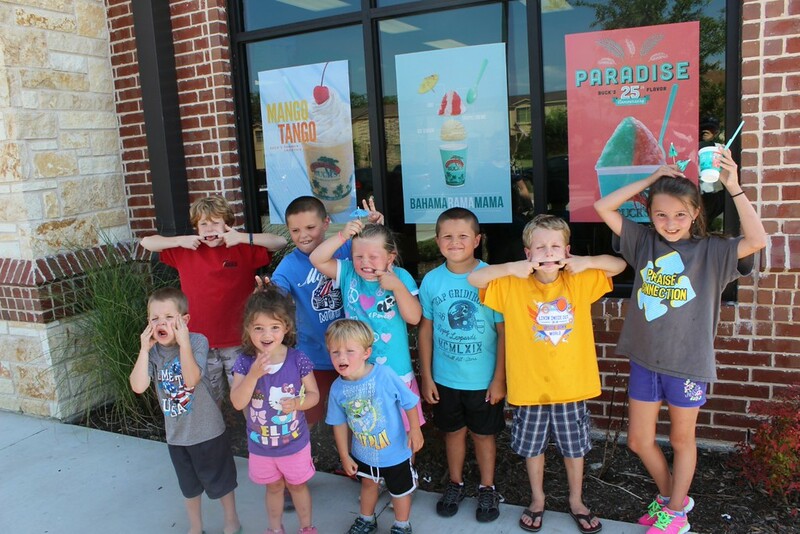 Fun time with friends at the sno cone shack! Robby stirred first this morning and soon we were all awake The kids seem to drag most mornings but not on a trip morning. They were up and getting ready and soon we were all in the van headed on our quick trip to the big D.
The first highlight of the trip was a stop to get ice. Keaton and Campbell even unbuckled so they could look out the window and see the bag of ice fall from the machine-it really doesn’t take too much to entertain my crew. Once we were on the interstate, I passed out our leftover doughnuts while we watched an episode of Little House on the Prairie. We only pull those videos out when we are on a trip and everyone enjoys them. Yesterday after the pool, we sat in the car listening to the end of a Little House book and when it was all over the kids clapped like we had just finished watching a play. My Campbell is the hotel girl. We had only been on the road for a bit when she started asking what hotel we would be in tonight and where we would be tomorrow night. When she found out that we would not be in a Holiday Inn Express, she was very disappointed and said “I love Holiday Inn Expresses.” I sure enjoy their cinnamon rolls too but I am counting on the breakfast at Embassy to be wonderful! We really made one stop on the way to Dallas and that was right after Texarkana. I actually drove from then on (Robby loves my driving so that he wanted for me to drive the rest of the way-it makes him feel safe! Actually, he was doing some work so it probably wasn’t safe for him to text, use the computer and talk on the phone.) The kids watched movie after movie and ate snack after snack. It is almost comical because they will eat one snack and then within seconds will look up and ask for another snack. Sometimes I wonder if they have worms! The first stop was In and Out burger for us to grab a bite to eat to take to Jacqui’s house. Graham thought it was very funny that we were going In and then Out at In and Out. From there it wasn’t too long to get to Jacqui’s house. As soon as we walked in the door, my kids and her kids went upstairs to play. They had trains and I am surprised that I was able to get Whitman to come downstairs and eat anything-he loved playing with all of the toys. All the kids enjoyed playing and when Jacqui mentioned sno cones, my people were ready to load up and go and eat. After eating outside in the 102 degree temperatures, Reagan who had just returned from grabbing a straw, said that there were booths inside and asked if they could go in and eat. I said that they could and soon all of my people were eating inside at a table while we were baking in the sun. The sno cones were worth the baking though. From there it was just a shortish drive to our hotel and we did something we never do-checked in around 5! We went up to the room and vegged out for a few minutes before heading down to the pool. The kids swam and swam-they just seem extra noisy in a hotel pool but they had a great time and we probably could have put everyone in bed when we had finished swimming but instead we cleaned up and headed for a night out. We went right down the road to a restaurant called Abuelos. The food was good but they had the most beautiful/interesting spanish style paintings on the wall. I could not stop looking at them (I am probably the only one in my party who noticed them but thought I would still share.) The kids ate and ate-we only ordered two meals and as you can see by the picture of Reagan holding one of our meals “El Grande,” we had plenty of food. Sometimes we feel guilty only ordering just enough for the kids and having them split but if we would have all ordered something, we would have had to rent a catering truck to take the leftovers home. Once we left the restaurant, we headed back to the hotel-and passed it by. We were on the interstate and I heard the boys notice something next to the hotel and then shout “hey, isn’t that our hotel?” Indeed it was, but we couldn’t get there so we just took a loop (or two) around before we finally made it exactly where we wanted to go. Hey, we are in no hurry since this is vacation! Back in the room, we quickly changed into pjs and then brushed our teeth-but whoops, we forgot the toothpaste! Argh! How could I forget something as important as toothpaste when I have a 7 page packing list-did I not follow my list? Actually, I had packed away our toothbrushes in my travel bin and never thought about adding toothpaste. Thankfully the hotel had some tiny little toothpaste samples so we are good for tonight and in the morning!